This pair of dummy boards, painted on pine consist of a figure of a young boy dressed in a blue velvet outfit with lace ruffs and a pink sash wearing stylish boots with elaborate buckles. The female figure is of a young woman dressed in a blue and yellow dress with lace ruffs, a bonnet and is carrying a basket of flowers. 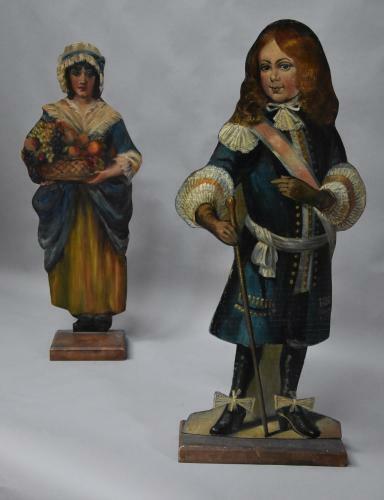 Dummy board figures were thought to have originated in the 17th century and remained very fashionable until the 19th century, they are often life-sized although sometimes smaller and were placed around houses, the figures usually resemble servants, soldiers, children and animals. Both dummy boards are in very good condition for age and can go straight into a home.